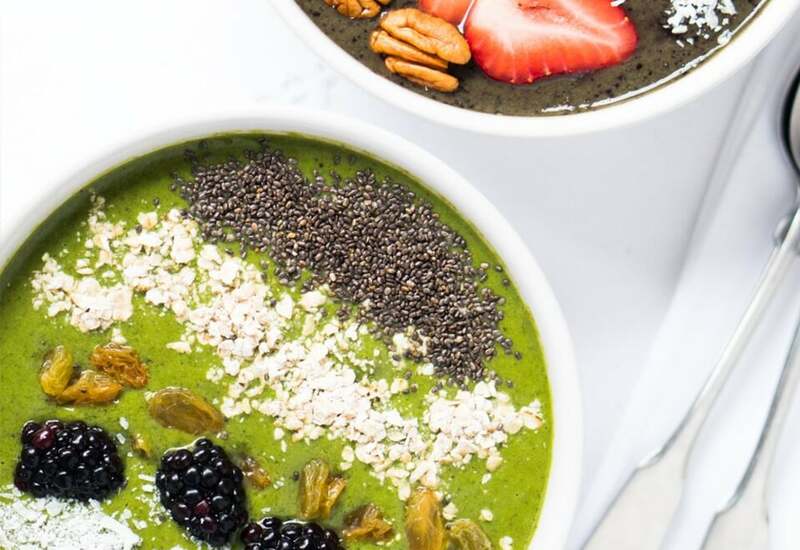 Eating 3 cups of kale first in the morning might seem impossible, until you meet these kale bowls sweetened with frozen bananas and berries. The key is processing the kale leaves along with mint, almonds, chia seeds and flax seeds in the food processor. That's when you then add frozen fruit and ice cubes to make it sweet and thick. Just like your favorite smoothie, only better! Top your bowl like you would your morning yogurt or oatmeal. Think additional flax seeds, granola, coconut, bee pollen, or fresh fruit. To make this smoothie even easier, use baby kale leaves. Then you can use whole and can skip the step of tearing and removing from the stalk. Spinach works great too! Frozen mango is also a nice fruit to add in place of the banana or do half banana and half frozen mango. Per Serving: 354 calories; 11g fat; 62.5g carbohydrates; 13g protein; 0mg cholesterol; 136mg sodium. Really delicious smoothie! Sometimes kale can be a bit bitter to me, but the mint and bananas really evened out the earthy flavor. In addition to flax, I also added some hemp seeds. My wife finally got me to try this kale breakfast bowl, and I'm glad I did. It's delicious and healthy, perfect when you need a detox. We didn't have frozen mixed berries, but used frozen strawberries instead and it was really good. I reduced the amount of liquid by 1-2 cup because I like my smoothies a little thick, especially when serving in a bowl. I also added spirulina for the health benefits. Delicious! Spinach worked perfectly in this recipe. I prefer it over the taste of kale. I also added a drizzle of honey and fresh fruit for topping. Definitely a great breakfast smoothie. I added oats to to this smoothie, it was really filling. I also added agave syrup to sweeten it little bit.